It's 10 p.m. and I am sitting on the couch post-scalding hot bath, watching Harry Potter and the Deathly Hallows part 2, drinking champagne, and eating popcorn for dinner. It's everything I wanted it to be. I taught two barre classes tonight. Normally I don't do that, but my beloved home studio needed a sub for the 7:00 class and my job at TCU kicked back up this week so I had my regular class there at 5:30. Forty people came to the first one. Forty! So fun, so crazy, so loud. I loved it. Every muscle I have hurts right now, but the popcorn + cheez-its plus the memory of the new sparkly leggings I bought on the way to my double-header have revived me, so let's blog. When we last left off, it was the night before the first day of school. My favorite day! The kids like it too. Uniforms were donned, superhero muffins were eaten, and traditional first-day handshakes were given. We got to school ten whole minutes early (this is remarkable given that our school day starts 15 minutes earlier this year), just in time for it to start to rain. We got a picture in front of the school anyway. Traditions are important. Claire, our 3rd grader(! ), was BEAMING with excitement. Of course. No one loves school like Claire loves school. She wants to be a teacher when she grows up and greeted her new teacher with a huge hug. And then she got a daddy-hug from James. He gives the very best ones. Landon is in 5th grade. 5th grade!!! Next year he'll be a middle schooler. In a middle school. A school that is not our sweet local elementary school that we ADORE. Cora is in her last year of pre-K at her little Montessori school nestled in between our house and the school that is 0.2 miles away. After 11 years, 3 children, and one million daycare payments, every month we pay her tuition is the last time we'll ever pay that month's daycare tuition. This excites me. She got another daddy-hug. She continues to take school very seriously. This picture from her teacher cracked me up. She's like, don't bother me with your nonsense, I'm busy LEARNING right now. Unless she's on the playground. Then she's always deep in a gaggle of her besties, leading whatever game she's made up and decided they need to play. Landon started his competitive climbing practice on Monday and he LOVES IT. Loves it so much. Bouldering his way up a sheer wall is literally all he's ever wanted from life. To make his obsession worse, we let him watch Meru with us, an absolutely fantastic and terrifying documentary about the only successful ascent up the Shark's Fin of Mount Meru in India. There's a quote in the film that says something like 99.99% of people who watch this will think it's crazy, but the rest will want to do it. Landon might be part of "the rest." But she warmed up. Soon she was finishing every move with a very formal salute that absolutely cracked James and I up. Where does she get this? Claire beamed the entire time and waved to me every 15 seconds after I got there towards the end. Both girls loved it. When Cora got off the floor she said, "Mama! I want to do it again!" "You can!" I told her. "Great!" she exclaimed as she ran back out to the floor while I yelled, "No! I meant next week!" After gymnastics, while Landon was at climbing practice, both girls felt inspired to dance until dinner. Claire set up a videographer to capture all the artistry. I believe this one was choreographed to Taylor Swift's, Welcome to New York. Monday: Trader Joe's gyro meat, heirloom tomatoes tossed with feta, cucumber, kalamata, orange pepper, red wine vinegar, and olive oil (and oregano, salt, pepper), naan bread, and roasted potatoes. And tzatziki. Basically a Trader Joe's Mediterranean platter full of all my kids' favorite things. Tuesday: OUT! Celebrating back to school, my first barre class of the new TCU semester, and James being off this week (and one of our favorite local restaurants having a "kids eat free night" on Tuesdays that we never take advantage of). Wednesday: I'm super proud of this one - it was supposed to be pork enchiladas, but I realized we didn't have enough leftover and it was probably too old, so rather than eat out like I REALLY WANTED TO, I improvised vegetable enchiladas with a leftover zucchini in the fridge (from the super hero muffins), shredded carrot (that we always have on hand), frozen corn (ditto), and black beans (ditto again). Sauteed it together with chili powder and cumin, rolled into tortillas, topped with a bit of sour cream and shredded cheese and baked. SO GOOD. Seriously. Crazy good. Sliced avocado, tomato, and black olive served alongside. Thursday: Leftover pasta sauce from Sunday with new pasta, garlic bread, and raw veggies on the side. I was teaching barre x2 and James loves a good pasta leftover. Friday: Back to school pool party with friends! Our house, snacks, paper plates that won't match, rose wine poured into a margarita machine to make frose, and pizza from Costco. Plus a whole bunch of children and their parents. I'm looking forward to it. I hope all your first weeks (if you had them) have been wonderful, and a rose is waiting for you at the end of it. Back to school is my favorite. I have a lot of favorites, but the morning of the first day is definitely in my Top 5. Today has been a day of preparation. Superhero muffins for the kids in the morning, my mom's homemade poppyseed bread with orange glaze for the teachers (and a loaf for us as well), my Aunty Lee's spaghetti sauce for the traditional back-to-school dinner. Uniforms were hung, backpacks were packed, good luck notes for lunch boxes were written. We are READY. The girls helped me cook. And by helped I mean fought a lot over who could dump in the various ingredients and generally made everything take 10x longer. The men of the house retreated to Landon's room to build Legos when certain tweenage men objected to the division of labor for the egg cracking step. I taught a fabulous barre class somewhere in the middle. I am absolutely loving my Sunday early afternoon class. We get to do family stuff in the morning (we have children; we're up early), we always end up back at the house for lunch and then I run out for my 1:30 class. I'm home by 2:45 and the day picks up from there. I'm getting a steady group of regulars and I absolutely love walking in the door of my sweet studio. And having excuses to order more leggings. Always with the leggings. I used my impending loan payoff to treat myself to an item or two. These Tom's were the "two." To move backwards in time, on Friday we came out of our bedroom to find Cora happily esconced in a tiny box that had delivered new Tom's to me the day before. We frequently joke that she's a cat because she loves to sleep more than any toddler I know and will curl up with a smile in any location and during any activity. We cracked up, snapped a picture, and put the box out by the back door to go out to the recycle. The next morning we again found Cora like this, back in her box she'd retrieved from the back door. We're letting her keep it now. Later on Friday we took the kids climbing. After hearing about camp all week and buying Landon his new gear, I wanted to see him in action. He's pretty good. Not that I know anything about climbing, but he's strong and long and it seems to work out for him. James got to play too. I cracked up when I saw him doing this from across the room. Landon had just been doing the exact same thing. Claire is also good- she has the strong and long thing going for her too, but she is totally dedicated to her upcoming and new career in gymnastics. A friend delivered a few bags of her daughter's old clothes last weekend and the girls were THRILLED to discover some leotards and dance clothes. Cora is also getting to do her first-ever outside of school activity (besides swimming which costs us nothing and which 2/3 of the children are being driven to anyway) and she chose gymnastics. Both girls have their first class this Wednesday at 4:00 and they are PUMPED. Even later on Friday, because we're still there, we had Meet the Teacher night. I volunteered the whole time, James sat through various presentations, our children ran around with their friends and met their teacher (somehow Claire was the only one who attended her teacher's presentation on behalf of the LagLiv family and she took her task of updating us very seriously). Afterward both big kids spent the night with different friends, and I celebrated a successful event with my PTA ladies. Tonight, after our delicious spaghetti and with everything as ready for tomorrow as it can be, we watched School of Rock with the kids. Because nothing says "school is important" like a movie about abdicating all school-related responsibilities and making a rock band. We all enjoyed it thoroughly. Tomorrow morning we have a 5th grader, 3rd grader, and pre-K'er. The first day of Landon's last year in elementary school. The first day of Cora's last year in Montessori school (and our last year of daycare after what seems like ONE MILLION OF THEM). I'm far more sentimental about the first thing than the second. Claire's first day of third grade, which is less milestoney, but still exciting simply because NO ONE is more excited about school than she is. Still. Four years after starting Kindergarten. "I'm just SO EXCITED! ", she told me a thousand times today. Me too. I've got my first day outfit all picked out and new pens in my purse. Some things we don't have to give up just because we had to stop going to school. So last time we met I was preparing for my final round interview the next day. After my last round of interviews, when I was forced to wear my mismatched black "suit" because apparently my body isn't exactly the same size it was the last time I bought a size 0 tailored suit in 2011, I vowed I'd have a real suit before the next one. I was about to buy one at Ann Taylor when I went through Landon's closet to determine whether he needed a new ski jacket for our next trip and I found a gorgeous navy blue suit wrapped in plastic that actually fit me! I was so excited- it was like I had my own fairy godmother in the form of myself circa 2013 doing things I totally forgot about. So last Wednesday night I went to my closet after the kids were in bed to put it on and test out the right shirt and shoes and jewelry and possibly practice a few interview questions in the mirror because a potential assistant director likes to be prepared. But I got to my closet and my "new" suit wasn't there! I looked behind every hanger but it was nowhere to be found. And then I remembered I'd taken it to the dry cleaners to be steamed and pressed two weeks before when I found it. And it was now 9:30 at night and the cleaners was closed and my interview was the next day. So back to my $24.99 mismatched Ross "suit" I went. And though a friend offered to pick up my suit from the cleaners and bring it to me in the morning, it felt right that the fake black suit and I remained together. The interview went well, I thought, though it's a bit of a blur. My prep paid off. It lasted 65 minutes and when I was done I walked directly into my friend's office, slumped against the wall, and proclaimed I'M SO SWEATY. And I was. I texted my mama friend chain, because they've had my back since the original suit situation, and at their offer to meet for margaritas after work, I jokingly said, "well I'm teaching barre at 7, but if anyone is up for one after 8, I'm your girl." "I am!" one said. James had to work on swim lesson scheduling for fall, so after debriefing with him for a bit, I found my sweaty post-barre self sitting at an outdoor patio table at 9 p.m. at a neighborhood restaurant just down the street, celebrating being done with the interview process with two of my favorite people. It was all night happy hour and we didn't even know. These were $5. And then two more friends rolled up as a surprise. It was so fun. It so perfectly encapsulated why I feel so happy with my life right now. 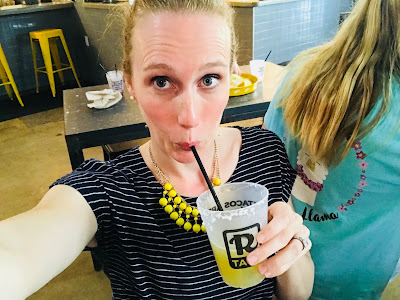 A new potential challenge at work, a barre class full of people I got to make sweat and groan and laugh with me, kisses goodnight to the kids, time on the couch with my husband, and an impromptu laughter and margarita-filled night out with friends. I'm so very glad I got to have it. Particularly since I found out the next morning that I did not get the position. Many compliments on my performance were given, genuine and thoughtful commentary was made regarding my future, but after getting so close and waiting so long (the original application was due before Memorial Day), the blow was sharper than anticipated. There are very limited opportunities for advancement in my division and promotion aside, this was a position I genuinely wanted. Then one of my best friends at work announced she was leaving to join other friends who left and that blow was sharp as well. Luckily, in a bit of accidental foresight, I had already booked a fancy dinner date for James and I on Friday night, intending to celebrate being done with the interview process and instead used got to use it as recovery self-care. It was an absolutely wonderful evening. Of all the things I love, sitting at a small table with a dressed-up-James and a dressed-up-me eating a long, lingering, delicious dinner is probably my very favorite. And before we went out, when I texted the news to my mamas, knowing the old me would have felt too vulnerable and wished she'd never said anything at all rather than risk a public failure, it felt so good to know that they were the second text I sent. And I got such sweet, supportive comments back. And from my parents. And even my baby brother. Vulnerable can be good. Trying something you're not certain to succeed at is good. I'm not going to say failing is good, but it's not so bad when there are so many people to catch you. In other news, the kids were at climbing camp last week and it was their very favorite ever (besides Papa Gigi camp of course, and Claire's Greatest Showman jazz camp). Landon, who has read every book on Everest I'll let him open, is OBSESSED. He was invited to join the competitive year-round climbing team at the end of camp and he was SO EXCITED. We immediately went to buy climbing shoes. And ordered a chalk bag and chalk ball from Amazon. These are not things I previously knew existed. He'll be climbing every Monday and Wednesday night from 5:30-7. There are competitions. And seasons. It's a whole new world. My new life's goal is to keep him off Everest. On Saturday we woke up to pouring rain and lots of snuggling. Then Cora wandered in and decided to snuggle too. That's me underneath her. The girls danced to Claire's new obsession, One Direction's "That's What Makes You Beautiful" for several hours. Dresses were donned, brothers who were just trying to read on the couch were bothered, and moms were deeply amused. There was also an audience. It rained all day. I feel like we handled it well. Lots of laying about, a little yoga, games, reading, and other indoor activities. For dinner we did make your own pizzas. It was really kind of a lazy approach to dinner, but the kids thought it was the greatest thing ever. Landon's pizza had about 5 tiny pieces of cheese on it and he declared it to be the best he'd ever had. I told him it wasn't even pizza. We watched a Lemony Snicket marathon on Netflix (the kids are LOVING that show, and James and I are too), did an Ice Cream Sundae bar for dessert, and then tucked our ducklings in bed after a genuinely fun day and prayed for the rain to STOP because we absolutely could not do it again. The week progressed. I squared my shoulders and was back at work on Monday still in the job I had before Friday that I liked quite a bit before I thought I might get another one. It's like touring a new house and discovering you can't actually buy it. But I'm super busy right now and I ate a delicious lunch with one of my few remaining work friends and so the world keeps turning. It rained again, and since the kids are doing James's swim camp this week, he got to spend extra indoor time with them and I'm pretty sure his noise canceling headphones were involved. Landon made a fort and declared it "EPIC" and I have to admit that it really was. I taught more barre, did more work, made more dinners, and then on Wednesday I paid off my last two law school loans. $160,000 in principal, plus 10+ years of interest, over 15 loans spread over 7 different lenders because they kept going bankrupt as the country inched closer to a financial crisis at the same pace I inched closer to my JD. I got an email from the registrar's office the day after I had Landon. Sitting in my hospital bed with a baby fighting to breathe in the NICU who I hadn't even been allowed to hold yet, I found out that my lender had gone bankrupt so my loan was gone so my tuition was not paid and it needed to be paid in seven days or I would be un-enrolled. 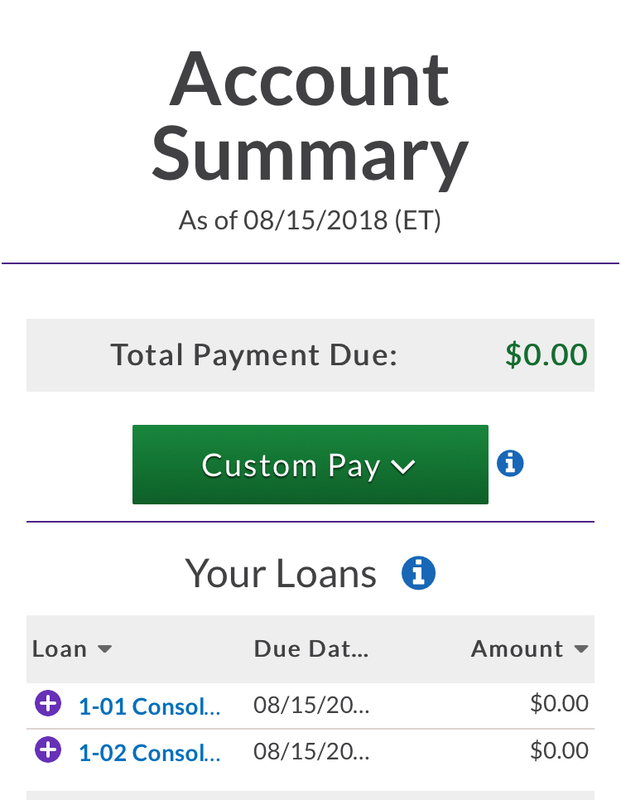 I contacted the financial aid office, secured a new loan at a higher rate (9%! ), and felt lucky to have one at all. Years and years of paying more for daycare and loans than our house and it's all down to 0.00. It was a more emotional moment than I anticipated. James was coaching late, so the kids and I gathered a few more of my mamas to celebrate. Now we just have $14,000 left of James's MBA loans, which is a tiny and adorable figure by comparison, and Cora will be done with daycare forever in July and then James and I will have been married for 15 years and we are going somewhere AMAZING to celebrate all these things. But for now, I'm here. I bought a new pair of leggings that I wore to teach barre tonight. I'm the VP of Membership this year on the PTA Board and have Meet the Teacher night tomorrow night. The kids have selected spaghetti as their night before going back to school dinner. I'm so excited about the new school year for them- Landon's last in elementary school, Cora's last at Montessori. We're in such a good place right now, I'm really just trying to soak it all in.